Health risk of obesity is a heavily growing concern for societies across the globe, as it is the root cause of several lethal diseases, for which the cure is highly expensive. I tried an innovative approach with some formulations and calculations, and it has shown excellent results.The work is intended to explore the efficacy of the judiciously practiced weight loss measure for an interested obese person. The manuscript explains the concept with the formulated enhanced impact of this methodology and thus presents an exploratory logical hypothesis. It is proven to be a reliable tool to fight obesity without medication treatments. Runthala A. Tolerable environmentally inverse constrained functional metabolism: Key to fight obesity. Russian Open Medical Journal 2012; 1: 0309. A highly widespread problem, i.e. Obesity is a medical state in which excessive fat in the body gets accumulated to a level, where it becomes lethal for the body itself. Despite the detailed knowledge of several known root causes of this disease, we can't stop us from being more and more obese. Obesity, if untreated, becomes the initiating factor for several diseases including heart diseases, Diabetes Type-II and several bone related ailments . Seeing the majority of heavily weighed persons in my family and being a biology student curious to learn new lively concepts, our hypothesis is drafted as an interactive study between the health professional and the anonymous reviewers. I represent a hypothetically well proven study to fight obesity and thus invite the reader to mark their views supporting this hypothesis. Obesity is one of the major problems today. We investigated our hypothesis to study the root cause of the obesity, possible scientific ways to reduce the additional fat deposits and thus worked out the logical reasoning to develop a simple weight loss measure. I strongly believe in the adequate impact and widespread utility for this methodology and thus conclude for a well reliable, simple and employable approach to attempt weight loss in easy steps. Obesity primarily starts with the accumulation of excessive fat molecules in the adipose tissues which are mostly present as subcutaneous layer underlying the skin. This excessive fat accumulation then becomes problematic for the system itself, as it would need excessive supply of nutrients for the proper maintenance of these tissues , which consequently lead to an increase in appetite. Lack of required amount of physical activity in comparison to the high amount of appetite neutralizing food intake further amplifies the problem and this vicious cycle doesn't halt, thus leading to an additional increase of the body weight conglomerated with free additional health problems . Hypothetically, it is obvious that people who skips food or do not consume the optimal quantity of food, also gain additional weight as it decreases the body's metabolic rate for cells employed in food digestion. Normally considered dieting and physical exercises as basis for treating obesity further cause problems such as peptic ulcers and cancers in later stages, as the body is scheduled to produce peptic juices at its time and absence of food/at the biologically scheduled time point invites its bad impact on the body tissues . Currently, Obesity is the major cause of a preventable death toll of people worldwide , and is thus a major problem of the 21st century, excessively prevalent in developed nations . Obesity is ill considered as a symbol of wealth and fertility in some parts of the world . Despite the development of several methodologies for treating obesity , its treatment rate is pretty lethargic. Improvement in diet quality, reduced consumption of highly fatty foods and sugars, heavy uptake of dietary fiber, excessive physical workout and the practice of skipping the lunch/dinner are some commonly tried ways to fight obesity. Even the dosage of anti-obesity medicines are tried to reduce appetite or inhibit the absorption of fat along with a well-planned suitable diet. If all such treatments fail, a surgery is normally done to cut down the additional fat deposit from the body . But this entire practice is extremely costly, painstaking and full of laborious exercises [10, 11]. Basal Metabolic Rate (BMR), defined as the resting stage expense of stored energy through normal biochemical pathways of the life processes burnout the stored energy but there comes the planned trick of optimal balance. A simple effective way is thus planned and proved to fight efficiently against obesity. Our simple approach targeting obesity is completely based on scientific equations to alleviate the additional weight of a person. Science shoots the obesity in very simple terms. Methodology rolls around the inversely imposed pressure of the currently available forced natural constraints. For instance, an obese person should tolerate hot or cold climate to some extent instead of utilizing the temperature controlling gadgets. Effect of temperature on the energy metabolism is already well studied . Similarly Specific Dynamic Action coupled with nourishment is responsible for the thermoregulatory energy needs of the organisms . Thus, the obese person sustains the exposed weather constraints as an inverse of normally followed practice, with all the daily activities unhampered. It forces the additional burnout of glucose molecules, as they are the body's primary energy source. Such intentional continuous exposure to available environmental constraints leads to sharp shooting of glucose utility by the body as it tries to maintain the homeostasis through functional network of proteins. This scientific approach is mathematically represented below. To prove the methodology, we need to consider the equation of heat energy produced by a substance in an open system, as our body is also a kind of open system. As glucose is the major source of energy in the system, heavy requirement of burning additional calories implies the direct expenditure of glucose molecules. Considering the adjacent equation for the same with Qs (Heat energy produced due to the substance), Ms (Molecular Mass of the substance considered), Ss (Specific heat of the substance) and Δts (Considered temperature difference for the calculation of resultant heat). · Molecular Mass of Glucose= 180.15588 g/mol. Lastly, knowing that the burnt glucose is supposed to neutralize the body temperature in all sets of imposed constraints, the heat energy generated by glucose is directly utilized the best way for stabilizing the body temperature . As a person's body is made up of water content normally being 45-60 percent, the entire glucose energy is best utilized by water to stabilize the body temperature. The glucose heat is also employed by body’s stabilizing mechanism of chaperons and other structural proteins for maintaining the body's physical entropy to zero. As the latter is difficult to be represented mathematically with all the available known details of in-vivo biological stabilizing constraints and while the former's proportion dominates the latter one, the water and glucose energetic inter-relationship can be mathematically represented as the adjacent equation. 75.29 and 115 are the respective specific heat values for water and glucose. Normally, the person alters the room temperature according to the available weather conditions although he can pleasantly be comfortable at the room temperature itself. Such a workout of the body at exposed and available set of constraints would force the body to continuously neutralize the sustained temperature difference. It could be done through sweat if it is more than 37ºC outside or burning more energy to keep the system lively at 37ºC. For example, a person sitting in a cabin with the room temperature of 42ºC is imposed to a temperature difference constraint of 5ºC assuming the complete absence of humidity in the room (making the study simple devoid of the unaccountable effect of humidity and water vapors on the body). So, if the person doesn’t use a fan or an air-conditioner, the body would definitely be imposed to an additional metabolic stress and it should result in a significant utilization of the stored energy by the complete body. Therefore, the person living in the natural set of environmental constraints under the allowed and person’s sustainable threshold would burn a large amount of energy for this heavy metabolic workout. The most important considerable suggestion here is the fact that person should consume the same amount of food per day with no additional calorie intake. Thus as obvious, the additional burnout of stored energy keeping the hunger fixed will definitely lead to a considerable loss of weight by the person. 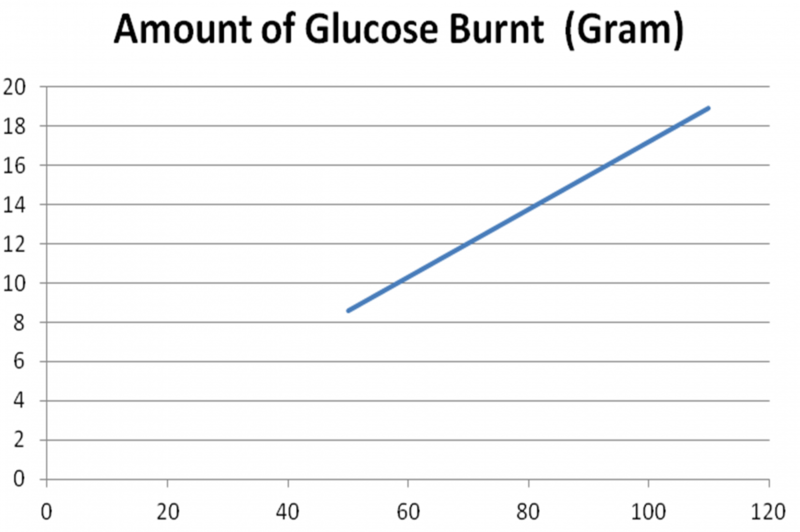 These results can be represented as Figure I, where body weight of a person is plotted against the mass of glucose utilized by person. Under the allowed temperature difference of just 5ºC, which is pretty less to show the true potential of this treatment, the table I data is an outcome for the body weight of a person and the concomitant amount of glucose burnt in this workout. 1 calorie is the estimated energy required for the 1ºC temperature increment of 1 gram of water at standard atmospheric pressure condition being equal to 101.325 KPa. The total chemical energy available in Glucose is 686 Kcal/mole. So, energy produced by glucose = calories/gram ≈ 3807.873544 Calories/gram. Therefore, consumption rate of glucose = . Such a data interpretation yields the following results as listed in Table 1 and Figure 1. Figure 1. Sharp plateau of the weight decrement rate shows the effectiveness of the strategy. The discussed approach is highly efficient in fighting the targeted weight loss goal in a minimal time span and is proven to be highly effective weight loss measure. The manuscript paves the way for an algorithmic development of a scientific weight loss approach. Obesity and physical workout are two different things and the eminent balance must be maintained for all nutritional requirements of the system, as they share a mutually inverted effect on the body. It is important to delineate the set routine of the applied constraints, inverse to that of the available environmental pressure, thus creating the stress which would result in the burnout of the stored energy. Follow-up of this routine is mandatory for a quicker and significant weight loss. Weight always increases due to our stubborn habit not to leave the appetizing food, however an optimal quantity (depending on the person’s energy requirements and the associated BMR rate, thereby also avoiding the consumption of several such unadvised food products including alcohol) of food consumption won't affect the body drastically and you would still reduce your weight with several careful precautions and exercise. Therefore, cutting the food supply causes adverse effects on the body and shouldn't be practiced. Another phenomenal aspect of this approach is the calculation of required time for attaining a desired weight loss. As the organism is a multi-cellular organism, it is really a cumbersome task to precisely simulate the in-vivo factors to calculate the weight loss rate per unit of time. Secondly, the energy requirement and consumption of a person is dependent on several daily activities and metabolic actions. Therefore, it becomes almost impossible to precisely estimate the time duration required for the metabolic utility of a specified amount of glucose quantitatively. A real-time weight measurement tool attachment to the body would become a robotic and expensive business and is thus not considered in the manuscript. The methodology is extremely fruitful for a person to allow his/her weight loss in a few simple steps with proper care and guidance. I started implementing this methodology on myself only on April 12th, 2012 and to my surprise, it has proven excellent results. From starting date till yesterday (June 22nd, 2012), my weight has reduced from 90.627 to 80.431 Kg. This shows that the methodology yielded me a loss of 10.196 Kg in 71 days (≈143.60 gram body weight everyday) and that too I didn't utilize any additional weight loss treatment. During this schedule, I consumed the scheduled diet of 120 grams of whole grain Indian bread(viz., Chapati) everyday along with 100 grams of vegetable and salad with no additional dietary supplement. It was worth noticing that this was the earlier dietary requirement too before this treatment. But during the discussed period I restricted myself from consuming additional food items of all types. So the same minimal food habit continued during this period and all other calorie intakes through additional overloading food stuffs were completely neglected. It is worth realizing that the weight loss rate of almost 143.6 grams per day is solely not the weight of daily burnt glucose, but rather it is a complete result of the generally performed workout of the body under the duration of sustained constraints. Hence, subject to the requirement and health reasons, the weight loss rate can further be increased considerably. Therefore, a devoted weight loss decision with the maximal amplitude of the sustained constraints everyday (as per the person’s will) would be really significant. The discussed approach won’t be a costly affair and is excellent to burn overloaded glucose molecules. 1. Haslam DW, James WP. Obesity. Lancet 2005; 366(9492): 1197–1209 (doi: 10.1016/S0140-6736(05)67483-1) (PMID: 16198769). 2. Kushner R, Bessesen DH. Treatment of the Obese Patient (Contemporary Endocrinology). Totowa NJ: Humana Press; 2007: 158. 3. Henderson CM, Robinson LM , Davidson PW, Haverman M, Janicki MP, Albertini G. Overweight status, obesity and risk factors for coronary heart disease in adults with intellectual disability. Journal of Policy & Practise in Intellectual Disabilities 2008; 5(3): 174-177 (doi: 10.1111/j.1741-1130.2008.00170.x). 4. Adolescent Health Committee, Canadian Paediatric Society. Dieting in adolescence. Paediatr Child Health 2004; 9(7): 487-491 (PMID: 19657417). 5. Melville CA, Cooper SA, Morrison J, Allan L, Smiley E, Williamson A. The prevalence and determinants of obesity in adults with intellectual disabilities. Journal of Applied Research in Intellectual Disabilities 2008; 21: 425-437 (doi: 10.1111/j.1468-3148.2007.00412.x). 6. Barness LA, Opitz JM, Gilbert-Barness E. Obesity: genetic, molecular, and environmental aspects. Am J Med Genet A 2007; 143A(24): 3016–3034 (doi: 10.1002/ajmg.a.32035) (PMID: 18000969). 7. Woodhouse R. Obesity in art: A brief overview. Frontiers of Hormone Research 2008; 36:271–286. (doi: 10.1159/000115370) (PMID: 18230908). 8. Bradley S. Tackling obesity in people with learning disability. Learning Disability Practice 2005; 8(7): 10-14. 9. Imaz I, Martínez-Cervell C, García-Alvarez EE, Sendra-Gutiérrez JM, González-Enríquez J. Safety and effectiveness of the intragastric balloon for obesity, A meta-analysis. Obes Surg 2008; 18(7): 841–846 (doi: 10.1007/s11695-007-9331-8) (PMID: 18459025). 10. Brown L, Stride C, Psarou A, Brweins L, Thompson J. Management of obesity in primary care: nurses’ practise, beliefs and attitudes. Journal of Advanced Nursing 2007; 59(4): 329-341 (doi: 10.1111/j.1365-2648.2007.04297.x) (PMID: 17635298). 11. Emerson E. Underweight, obesity and exercise among adults with intellectual disabilities in supported accommodation in northern England. Journal of Intellectual Disability Research 2005; 49(2): 134-143 (doi: 10.1111/j.1365-2788.2004.00617.x) (PMID: 15634322). 12. Simek V. Influence of single administration of different diets on the energy metabolism at temperatures of 10, 20 and 30 degrees C in the golden hamster. Physiologia Bohemoslovaca 1976; 25(3): 251-253 (PMID: 133367). 13. Battam H, Chappell MA, Buttemer WA. The effect of food temperature on postprandial metabolism in albatrosses. The Journal of Experimental Biology 2008; 211: 1093-1101 (doi: 10.1242/jeb.010728) (PMID: 18344483). 14. Ruff CB. Climatic adaptation and hominid evolution: The thermoregulatory imperative. Evolutionary Anthropology 1993; 2(2): 53-60 (doi: 10.1002/evan.1360020207). Ashish Runthala – M.Sc., M.E., PhD, Lecturer, Department of Biological Sciences, Birla Institute of Technology & Science, Pilani, India. Received 27 August 2012, Accepted 12 October 2012. Correspondence to Ashish Runthala. Address: Department of Biological Sciences, Birla Institute of Technology & Science, Pilani 333031, Rajasthan, India. E-mail: ashish.runthala@gmail.com.